Winding down, a photo by Becca Ashbourne on Flickr. At face value, this is a nice little pic of my sky island and of me winding down on a hammock at the end of a nice day. Sadly it’s more metaphorical than that, because the very good friend who has let me keep my lovely sky island rezzed on her sim is giving it up when the tier is due in a few days and I shall, for the first time in years, be homeless in SL. Given how little I log on these days, or log on just to go to an event or to see a friend, I will give vagrancy a go for a while and see how it works out for me. I’m going to miss my little place though, for sure. Me showing off my unique Katana, courtesy of Swordmaster Talus of Wasenshi featuring a black and pink tsuka (handle) unique to me and a silver bird design on the tsuba (hand guard). Because I’m quite petite, the sword is actually closer in length to a Wakizashi than a Katana, but since I’m carrying it as my main sword then it is a Katana. If that makes sense. The pic itself is pretty much unedited – I just corrected some clipping on the hem of the skirt and that was about it. Against his better judgement, Talus agreed to do a back-mounted twin katana set for me, even though he said I would probably slice my ears off the first time I drew them. After he had done them and I showed them off, he admitted that they did look pretty cool. In a Hollywood kind of way. ha ha. Wishing a very Happy Christmas (or equivalent) to all of my Flickr, Second Life and WordPress friends! Little pearl (revisited), originally uploaded by Becca Ashbourne. One of the attributes that defines art is that it is open to different interpretation. Art should elicit an emotional response, should engender debate, perhaps even controversy. By that criteria, this picture is possibly the closest I have come to creating art. 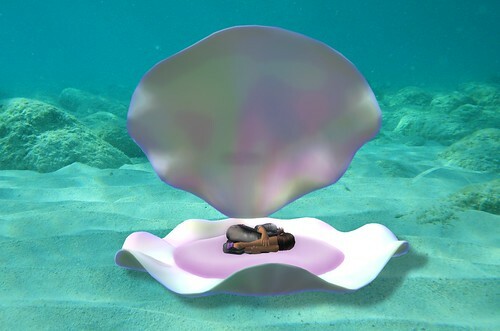 The picture had its genesis in September 2010 when I found the oyster and pose at a Japanese sim. However, whilst I loved the picture that ensued, I never felt that my skills with GIMP were sufficient to do it justice and I posted it pretty much “as is”. However, things have changed a lot since then. For this revisit, I masked out the blue background so that I could add a new one in, used the distort tool to painstakingly push and pull all those horrid straight edges and angles into beautiful curves, sorted out the terrible clipping issues on the girl, and added a shadow to the shell so that it blended in with the new background more. Sharing the photo with my friends has provoked some very interesting responses. Apart from the usual (but ultimately dismissive) “well done” or “cool”, I’ve had people perceive cuteness with an “awwwwwwww”, another friend ask me if I was ok, as they saw the girl curled up in the foetal position and interpreted that as her sobbing and trying to shut the world out. Another saw the girl as being precious because pearls are precious. For me, the latter is most close to what I see. Although I am by no means religious, I am aware that there is a phrase “a pearl of great price”, which derives from one of Jesus’ parables in the Bible (Matthew 13:45-46 according to Wikipedia) which denotes something of great worth that is to be treasured. For me the picture shows the girl as being a pearl of great price, but also very fragile and vulnerable too. Something to be prized, cherished and adored. 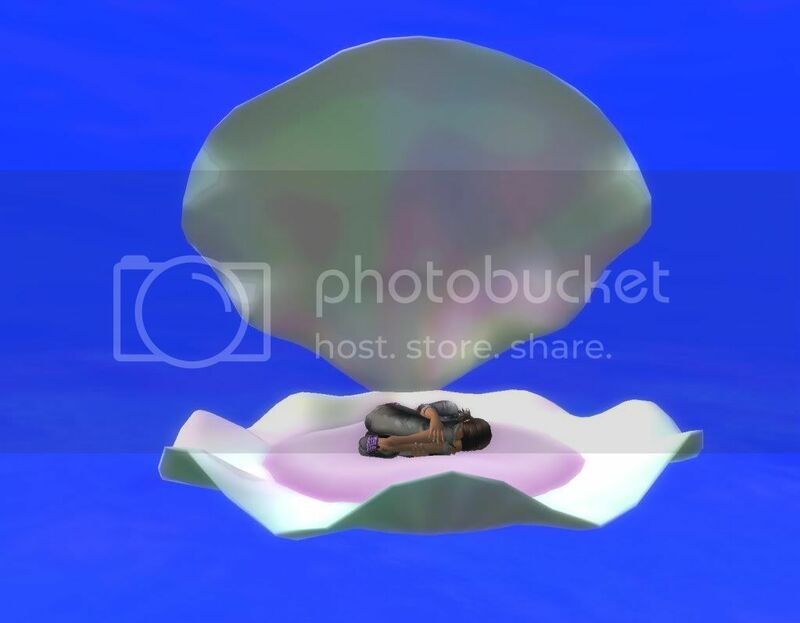 I also see elements of birth in it, as a pearl is grown inside an oyster like a baby in a womb, so the girl being in the foetal position is appropriate. Of course, there’s also the practical consideration of fitting the girl in the oyster and the foetal position is the most compact! But what do you think? What does the picture say to you? Do feel free to add what you see by commenting – I’d be really interested to hear. Slink Mesh Boots! !, originally uploaded by Nana Minuet. I have to say I was getting very excited by Mesh, especially with the recent announcement that Phoenix is going to be supporting it (thanks to some dedicated work by Henri Beauchamp of the Cool Viewer). These boots are a great case in point – imagine how wrong the knees would look in that pose if those were sculpt boots! However, all is not as good as it seems; I’ve learned that the current implementation of Mesh is worse than useless, for clothes at least. It would seem that a mesh object attaches to your skeleton, not your “flesh”, and cannot be resized in-world. That means that if you are slim like the model in the above pics, those boots would look great. However, if you are any other size than her they won’t fit. Oh, sure, an alpha layer will mask out the bits of you that the boots cover but if you have bigger thighs than her you’re fresh out of luck. One of the biggest benefits of Second Life is you can be who you want to be. You (or, rather, your avatar) can be exactly as you want it – it’s the overriding expression of your individuality and what makes Second Life so wonderful. But if Mesh clothing is going to force us all to resize our avatar to the clothing, rather than the clothing to the avatar, then this is a bad thing. There is a JIRA running on this. It’s rather technical but the gist of it is “change Mesh to resize to your flesh not be fixed size and attached to your skeleton”. Do I feel remorse when I kill, or just recoil?, originally uploaded by Becca Ashbourne. I love my digital art, and sometimes I like to mix things up a bit. The foreground is from Second Life, of course, but the background was taken in Crysis: Warhead. I spent ages on this pic, what with fitting the hair to the beret, finding the pose, doing the snapshots in both SL and Crysis, and then all the post-processing (not least correcting SL’s various clipping issues) . I’m quite pleased with the result. One trick I use a lot is to take a snapshot using the dialog and then use the mouse-based camera controls to get the angle just right and then refresh it again. There’s a simple tutorial on it here. If you’re into SL photography then it’s a great technique to master. Something that has annoyed me for ages is the foot shadow. I’m forever trying to correct it in post-production because the invisiprims on a lot of my boots cause the shadow to come out wrong. This problem will start to go away with the new alpha masking for feet in Viewer 2.0 but it will still be around for a while. So imagine my delight (and annoyance that I only just found this out) when I discovered you can turn off the foot shadow! For my next set of photos I’m planning on making use of the depth and object matte capture modes and introducing depth of field in post production. Should be a new challenge for me and I’m really looking forward to it. Watch this space!